Virginia Attorney General Mark Herring speaks at a press conference in Richmond, Va., in 2014. 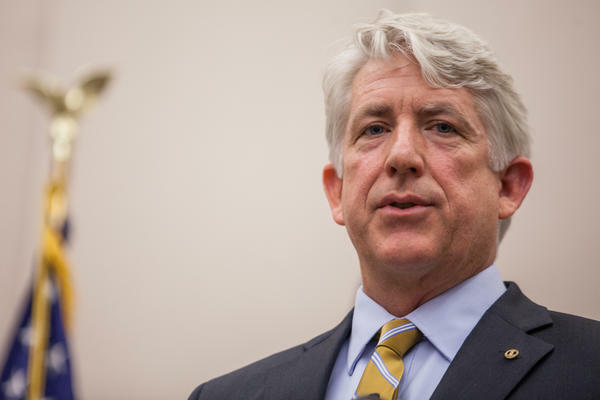 With Virginia's top two politicians mired in their own controversies, the state's attorney general, Mark Herring, has revealed a racial incident in his own past. In a statement released Wednesday, he said he and friends attended a party in 1980 dressed as rappers they admired, including wearing wigs and "brown makeup." "In 1980, when I was a 19-year-old undergraduate in college, some friends suggested we attend a party dressed like rappers we listened to at the time, like Kurtis Blow, and perform a song," he wrote. "It sounds ridiculous even now writing it. But because of our ignorance and glib attitudes — and because we did not have an appreciation for the experiences and perspectives of others — we dressed up and put on wigs and brown makeup." Herring also said he's "sure we all have done things at one time or another in our lives that show poor judgment, and worse yet, have caused some level of pain to others." The 1980 party, he said, is a "glaring example" of that. The statement comes after a racist photo on Gov. Ralph Northam's 1984 medical school yearbook page surfaced last week. The photo shows one person in blackface and another wearing a Ku Klux Klan robe. After apologizing for the photo, Northam later insisted he was not one of the people in it — but added that he had, in fact, appeared in blackface around the same time at a dance contest. Lt. Gov. Justin Fairfax, who would take Northam's place if he were to step down, is facing an allegation of sexual assault, which Fairfax has denied. Herring is a progressive Democrat whose life and career reflect Virginia's evolution from capital of the Confederacy to the only Southern state that President Trump did not win in 2016. "This was a onetime occurrence and I accept full responsibility for my conduct," Herring said. The 57-year-old Virginia native comes from Loudoun County, a once largely rural area that now counts as one of Washington, D.C.'s outer suburbs. Herring began his political career there on the Board of Supervisors, followed by eight years in the Virginia Senate. Reporters clogged the hallways of the Virginia State Capitol on Wednesday, hoping to question lawmakers over the myriad controversies circling Virginia's top Democrats. Many have not yet commented. Democratic Del. Mark Keam said he was on the House floor when Herring released the statement and is waiting for more information before commenting on the matter. But he says he's focused on getting through the legislative session, which reached a halfway point on Tuesday. "I would like to think that our government is a lot more resilient than one or two or three scandals that might be happening on any given day," he said. "This is, for now, political. We are focusing on governing. We are focusing on getting the people's work done. And as legislators, we have a lot of responsibilities on our plates, and we are focusing on our jobs right now." Asked if he had a reaction to Herring's revelation, Del. Lamont Bagby, head of the Legislative Black Caucus, replied: "prayer." Northam is facing a barrage of demands for his resignation. So far, no one has called for Herring to step down. "As a senator and as attorney general, I have felt an obligation to not just acknowledge but work affirmatively to address the racial inequities and systemic racism that we know exist in our criminal justice system, in our election processes, and in other institutions of power. I have long supported efforts to empower communities of color by fighting for access to healthcare, making it easier and simpler to vote, and twice defended the historic re-enfranchisement of former felons before the Supreme Court of Virginia. I have launched efforts to make our criminal justice system more just, fair, and equal by addressing implicit bias in law enforcement, establishing Virginia's first-ever program to improve re-entry programs in local jails, and pushing efforts to reform the use of cash bail. And I have tried to combat the rise in hate crimes and white supremacist violence that is plaguing our Commonwealth and our country.